After a difficult 2016, this year’s DEMSA conference had an altogether more positive vibe. Although these are still testing times for the debt management sector, it is pleasing to see so many receiving the seal of approval from the FCA. As Bev Budsworth (Managing Director at The Debt Advisor) mentioned, some will now find themselves in much better shape after going through the rigors of regulation. Melanie Giles, speaking on behalf of IPs, also raised a potentially interesting issue. She noted that it appears the pendulum is now swinging towards the IVA sector. One to keep an eye on. 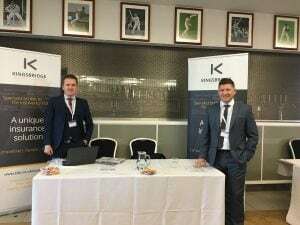 Kingsbridge are here to support DEMSA members and the industry, providing sound risk management advice borne out of many years’ experience dealing with Debt Management and Insolvency businesses. Adequate and necessary insurance protection creates a positive reflection on companies and the sector as a whole. This would include Professional Indemnity, Directors & Officers as a must have, with consideration for Crime and Cyber.